I think this is the only thread here concerning glow with the show ears. I don't see a protocols.ini entry, so please post a link to it. Instead, the previous usage with JP1 remotes was to convert signals captured with a Widget into the learned signal format used in JP1 remotes, and then upload that to the remote. This approach uses up the available memory fairly quickly, so it may be desirable to write an executor that can send the signals. Presumably only a subset of the possible signals can be generated in an executor. I suspect you're going to eventually want hardware with more memory, and an easier way to program than is available in a simple remote. I don't see a protocols.ini entry, so please post a link to it. Very cool! I have my proof of concept working off a universal remote. To incorporate these into my Christmas light show I need to build a beefier IR controller, then a software interface for sequencing. Thanks for all the IR codes. It was really helpful! I made an app for my smartphone that can change the color of the ears. I was wondering if anyone has seen any IR code that could put the ears back into the random mode that turns on after it doesn't receive any signals for a while? I know this is an old thread, but this is the best info out there that got me to where I am now. I used an Arduino to transmit the IR codes. Here is my working sample code. If anyone knows if there are codes to control the other ear, I'll update the post. IrScrutinizer can generate this sort of code automatically; just "export" using the export format "Arduino Raw". The enclosed sketch supports not only the traditional IRremote, but also my Arduino IR library, Infrared4Arduino. // This Arduino sketch was automatically generated by IrScrutinizer. // This file contains C identifiers which have been translated from command names. // A pretty silly main loop; just intended as an example. Thanks for the code. Unfortunately it's way beyond my skill level. I'm not a programmer. I just started with Arduino 6 months ago because a brain tumor turned my life upside down. I have some trouble learning new things now in addition to lots of other issues. My hobbies used to include engine swaps and motorcycle riding. Thanks for the code. Unfortunately it's way beyond my skill level. I'm not a programmer. My intent was to show that you can automatically generate that kind of code, using free software. You do not have to "understand" the code to use it (although it certainly does not hurt either ). I just started with Arduino 6 months ago because a brain tumor turned my life upside down. Sorry to hear that. But, as we see, it had at least one positive effect. Welcome to the community! I know you had good intentions and I thank you. If I can't understand the code produced, I can't change it to suit my needs. Don't waste your time trying to explain it to me, I'll read it 100 times and just end up frustrated. Thanks for the welcome! Sorry I don't have more to contribute. Thanks everyone! 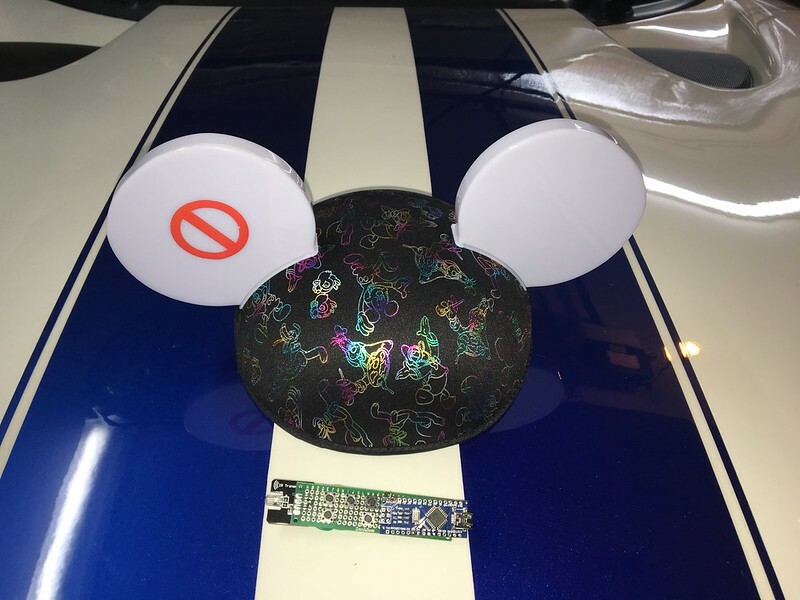 I think I'll program my MX-600 remote and take it to Disney. We only know the codes that are posted. If you were to find a source of any other codes that exist, like for the other ear, I could format them in the same fashion as the codes you posted. I just looked back and I can't believe that we never created a JP1 upgrade for these ears. Is there anyone here who could test an upgrade if I created one? Hmm, my understanding is that, for the named commands we have, command does something for the left ear-thingy, while command_r does the same thing for the right ear-thingy. I suspect that "the other ear" is some misunderstanding (man only have two ears ). If I am wrong, please correct me. I that were true, wouldn't ishootstuff have noticed that? I suspect that "blue" works both ears while "blue_r" only works the right ear, so we're missing "blue_l", etc. Most of them anyway. I have two ears, but only one of them works thanks to the aforementioned brain tumor. I'm not sensitive about it. Here's my hat and the sad little remote I made. I didn't have enough buttons laying around. I just watched some of the youtube vids on the hats in action and there are definitely more codes out there. I haven't even researched capturing the raw data. It's funny, I took the ears apart to add LEDs and saw there was far more circuitry in there than required to flash two LEDs. I didn't even know the ears I have had for months interacted with anything. I was all ready to fire up a Disney conspiracy theory on mind control.